I thought this picture might make you smile. 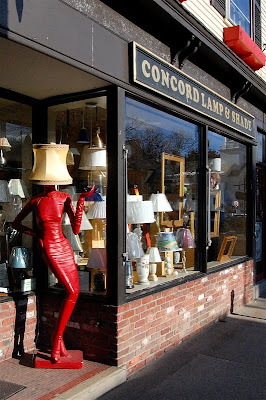 For once I had my camera with me when our local lamp store had the "lady lamp" outside! Our older son and his girlfriend arrived Thursday night for a flying visit - they leave again Saturday morning for Washington D.C. I am getting over my cold and it was a lovely day so we had a chance to go into town. 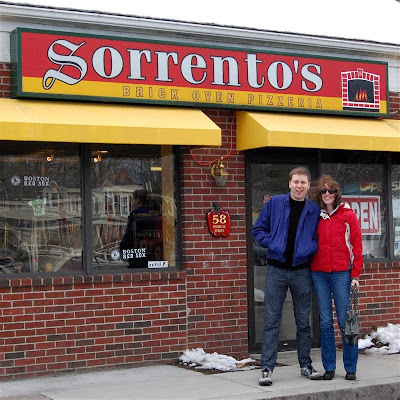 No visit home is complete without a trip to a favorite Pizzeria! You can see how the snow has melted drastically in just a few days - our temperatures have been in the mid 40's. We were able to see a lot of family tonight at Grandma and Grandpa's - most of the local relatives were able to come for dinner and a quick visit. 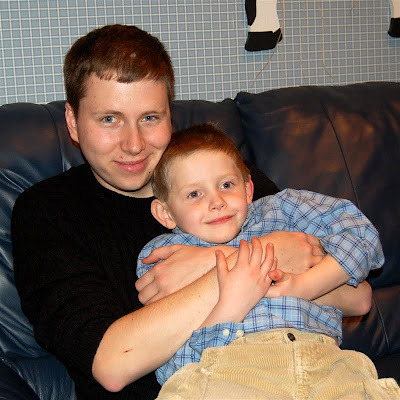 Isn't this a cute "Godfather/Godson" photo! Saturday is the second installment in the Design Studio Series I am doing on the Cuttlebug Challenge Blogspot. The intent of the series is to "begin at the very beginning" to help people who just got Design Studio as well as those who have never become comfortable with using the software. If you have been reading my blog for a while, most of the information should sound familiar but here is a LINK if you'd like to have a bit of review or if you are new to Design Studio. I WANT that tacky lamp! Concord, NC by any chance? If so, you are close by. Actually, it is Concord, Massachusetts. I think there must be a "Concord" in nearly every state!